After nearly 50 years service Pat McDonnell has decided to hang up his climbers and concentrate on his other handicap – golf. All of us who have had the pleasure of working with Pat will greatly miss his experience, knowledge, enthusiasm and humour. A function to mark Pat’s retirement will take place on Friday 24th June in Bobby Byrnes, Limerick from 5pm on. Pat hopes that as many as possible of his colleagues and friends will join him for the occasion. ESB continues to work towards a more consciously inclusive workplace and our Diversity Strategy identifies five key priority areas : Gender, LGBT, Disability, Ethnic, Family. ESB are proud members of GLEN’s (Gay Lesbian Equality Network) Diversity Champions Network since 2014 and have been working to ensure ESB is an LGBT+(Lesbian Gay Bisexual and Transgender) inclusive workplace. This is a key initiative to further support LGBT+ inclusion in the workplace. Further Business Unit Briefings will be arranged with the Internal Communications team over the coming weeks, beginning with a breakfast briefing in Electric Ireland on Friday 24th June. An Ally can be LGBT+ or non LGBT+ but is someone who proudly supports LGBT+ colleagues, is committed to raising awareness and working to ensure ESB is LGBT+ inclusive workplace and helps to create an inclusive environment / culture in the workplace where everyone can bring their whole self to work. If you would like to be part of this group, whether you are LGBT+ or not, just email beme and we will be in touch. ESB Staff 5k Challenge – Entries close Tuesday!! Final Reminder: Entries Close Tuesday!! To celebrate the sponsorship of Team Ireland for the Olympics we are hosting the ESB Staff 5k Challenge on Thursday, 23 June on Sandymount Strand at 6.30pm. This is a timed 5k race/ fun run and it is open to everyone in ESB to take part. It should be a great event, with winners’ prizes, goody bags, spot prizes and a BBQ afterwards in Sportsco. Runners will also receive an Electric Ireland ‘Team Ireland’ T-shirt. The entry fee of ?20 will go entirely to ElectricAid. You can sign up for the race using the online form on the event SharePoint site below. The last date for entries is Tuesday, 21 June. There will be no entries on the day. For anyone who would like to volunteer to help out on the day, there is also a link to the volunteer sign up page. 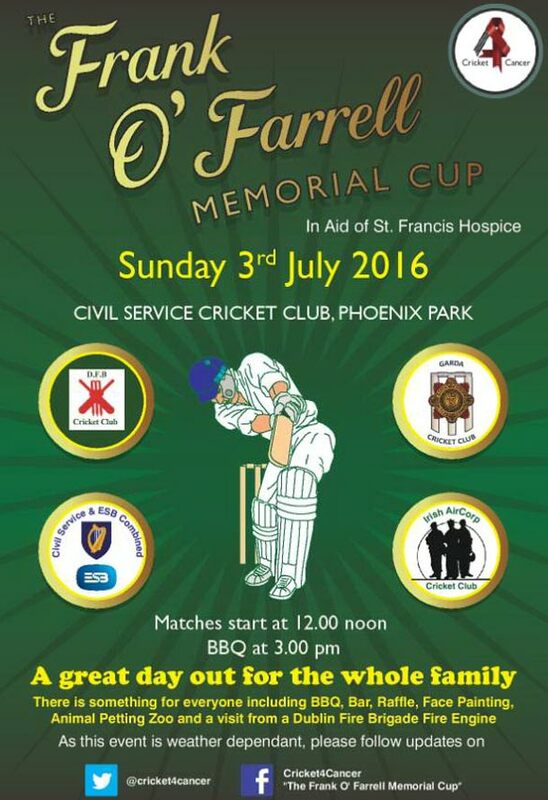 In aid of St. Francis hospice. After months of waiting the tournament is finally here! In the first week the action off the pitch by some supporters gained a lot of negative attention. The same cannot be said for The Green Army who have won hearts and minds – can the Boys in Green do the same? This support helped us take a first half lead over the Swedes but it wasn’t to be with the match finishing one a piece. Elsewhere there were some big surprises with Italy beating Belgium 2-0 (only 12 people predicted this result with a few confident people using their banker!) and Iceland drawing 1-1 with Portugal (only 7 correct predictions). Northern Ireland also surprised many by recording their first ever European Championship finals win beating Ukraine 2-0. As for our predictor competition Geraldine Heavey leads the way with 36 points followed closely by Fintan Colgan and Hilary Boyse on 34. It’s worth noting that the top 3 have used at least 5 bankers each. At the wrong end of the table are David Walshe and Niall O’Hanlon on 14 points each however they both have the majority of their bankers left, and are set to zoom up the table! It’s all to play for! See how you’re doing – can you slag off your mates? Can the top 3 hold on? Wait for next week’s update to find out! The society would be delighted to welcome new members. There is no joining fee and our next outing is to Tullamore on Friday 1st July. The tee is booked from 09:00 until 12:30 for the main 18 hole singles stableford competitions and from 14:30 to 15:30 for the fourball competition. Dinner will be at 18:15 sharp. The cost for dinner and golf is just ?40. As usual there are both Men’s and Ladies 18 hole stableford competitions. If you are would like to play can you mail me (tony.mcmackin – ext 26609) with your details – name, club, handicap, preferred time to play and any other special requests. A number of our ESB colleagues have been involved in cycling incidents, thankfully none with serious injuries. Some of them have now shared their experience, learning and advice in the attached video produced by the ESB Safe Cycling Group. The short version is under 2 minutes and the longer one runs for 4 minutes. It’s highly recommended, so please have a look – stay safe and enjoy your cycling. to everyone who supported our recent HB Ice-Cream Fundraiser events in the Head Office canteen, especially volunteers Nell, Allison and Angela. A fantastic total of ?856.27 was raised. Dave is retiring with over 42 years service with ESB. Dave has worked in Distribution Department, Dublin City District, ESBI on consultancy projects at home & abroad, Dublin Region and Asset Management. All of us that have had the pleasure to work with Dave, are well aware of his immense contribution to ESB over these years. His experience, knowledge and specifically his enthusiasm will be greatly missed. Dave would be delighted to see all his current and former ESB colleagues at his retirement function in ESB Leopardstown @ 5.00PM on Friday 1st July and afterwards in Kilmacud Crokes G.A.A. Club, Stillorgan. For those wishing to make a contribution to his retirement presentation please contact Paula Brennan (ext: 43334), Asset Management, ESB Networks, Leopardstown. After 36 years of dedicated service, Noel Delaney is retiring. Noel is marking his retirement with a function in Ahern’s Pub, Old Bawn, Tallaght on Friday 24th June 8pm till late. After 34 years of dedicated service, Paddy O’Connor is retiring. Paddy is marking his retirement with a function in ‘The Graduate’ pub, Rochestown Ave, Killiney on Friday 24th June 8pm till late. The next charity project is for Scoil Iosagain in Farannree in Cork. It is a very straight forward project again and is painting only. It is mostly corridors with a few small offices. The school is in a disadvantaged area in Cork city and they have run out of money to finish the painting of the school. Harringtons (Dulux) will supply the paints, Dosco the brushes, rollers etc. and ESB staff the labour. It is planned for the weekend 23rd/24th July and Dave Carey, ESB Networks in Wilton will be co-ordinating the day (dave.carey). IT IS WITH REGRET THAT I INFORM YOU OF THE DEATH OF ANNA YOUNG, MOTHER OF MICK YOUNG ESB NETWORKS ATHLONE AND FORMERLY OF ESB GENERATING STATION SHANNONBRIDGE. REPOSING AT FLYNN’S FUNERAL HOME, MOATE TODAY THURSDAY FROM 4.30PM. REMOVAL AT 7.20PM TO ST. CIARAN’S CHURCH, CASTLEDAY, ARRIVING AT 8PM.FUNERAL MASS ON FRIDAY AT 12 NOON, BURIAL AFTERWARDS IN KILCLEAGH CEMETERY. FAMILY FLOWERS ONLY PLEASE. To celebrate Global Wind Day 2016 Raheenleagh Wind Farm, a joint venture between ESB and Coillte, will sponsor the Ballcoog Run in Wooded bridge, Arklow, Co Wicklow. The Ballycoog Run, organised by the Ballycoog District Development Association, will take place close to the Raheenleagh Wind Farm. If you are interested in registering for the run please go to following link: https://gorun.ie/site/event_details.php?eid=975 All entrants should meet at the Ballcoog Community Hall at 11.00 on Sunday 26th June 2016. All proceeds will support the Ballycoog Community Hall, Wooded bridge, Arklow, Co Wicklow. UCD Festival talk “Water – An Engineers Perspective” June 18th. The UCD Festival, is a celebration for all and will take place on Saturday 18th June from 9am – 9pm. There is something for everyone at this event, from family fun, football on the big screen, reunion picnics, music, debates, presentations and talks. Of particular interest to the Engineering cohort will no doubt be the high level Ted-Like talk “Water – An Engineers Perspective” which includes key note speaker Michael Phillips, former President of Engineers Ireland and Engineer at Dublin City Council. This session will address the challenges facing Irish water infrastructure, securing the drinking water infrastructure for future Irish Generations and the Global perspective on water provision. He will be joined by Damien Owens and Professor Michael Bruen. Starting at 12.30pm and finishing at 13.30 pm. Places are limited so go to the UCD website http://festival.ucd.ie/ and book your place. This week is National Bike Week. As part of our effort to promote cycling as the only means of transportation that saves you money and burns pounds, the Safe Cycling and Gateway to Fitzwilliam Groups have organised a lunch time cycle trip to Gateway and back today. For those who are interested and cant make it today there will be another cycle trip this Friday 17th June at 12:45pm (An email will issue in relation to this). Details of other ESB Bike Week events are included on our Bike Week Poster. These routes will profile the more ‘off road’ route along the Grand Canal on the way to Gateway. Please note that this is a round trip cycle to Gateway. We will not be going into the building as there are other times available to do that. 5. Awareness – No headphones! A welcome to new and existing members to starting tomorrow 14th June. Well known as the most efficient grappling martial art and combat sport that focuses on ground fighting with the goal of gaining; Dominant position and using joint-locks and chokeholds to force an opponent to submit. It promotes the principle that a smaller, weaker person using leverage and proper technique can successfully defend against a bigger, stronger assailant. Regardless of strength, size, or previous training, anyone can learn effective submission techniques. Nothing feels better than knowing you can take care of yourself mentally and physically. We will continue to progress the levels of training throughout the year.
. or ?12.00 on a Pay as you go basis. Any further details, call me, thanks and we look forward to seeing you all.